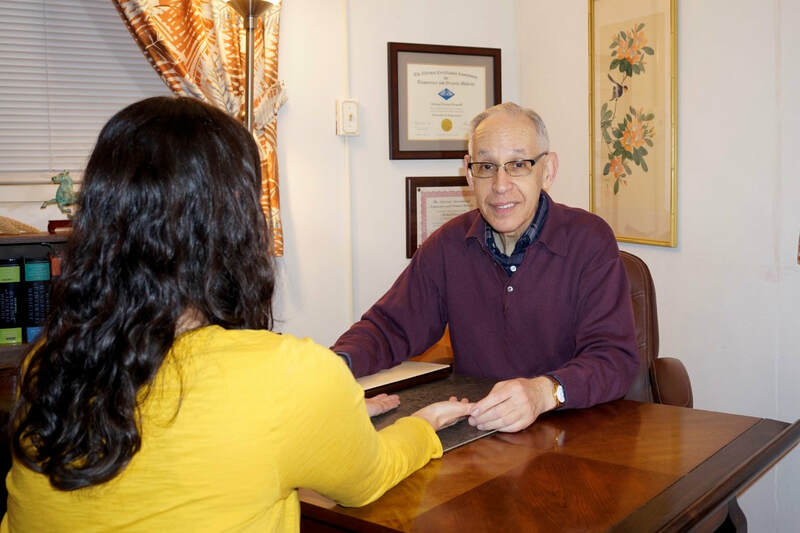 Counseling with Michael Rossoff, L.Ac. - Michael Rossoff, L.Ac. For Telephone or Skype Consultations Click HERE. A personal consultation is important for providing insights and feedback based on your individual health situation, with refined recommendations personalized for your needs. The level of detail and attention you receive in an individual consultation can increase the speed, accuracy, ease and confidence for your putting changes into action and for making your healing successful. A personal consultation begins with my reviewing the Personal History form which you bring, already completed, to the session. I then ask questions for additional information and clarification of details which may be important. Besides your primary health issues, your medical history and other details may be relevant in creating a whole picture of your current condition and needs, especially in the context of Oriental healing. Similarly, I need to know about your family history, health. Further, I need to know about present daily-life factors, such as sleep, appetite, bowel functions and more. I spend a brief amount of time doing Oriental diagnosis by looking at your eyes, ears, tongue, hands, sometimes your feet, and taking your 12 pulses - 6 on each wrist. Occasionally I need to press a few spots (acu-points) on the back or front torso. This approach of evaluating and assessing the internal organ-energy systems can reveal profound insights about your problems, their underlying causes, and connections between imbalances. My ability comes from my many years of training and study, observation through experience and reflection. During the next part of the session, I give you useful explanation and insights from my assessment. Often people find this feedback fascinating and reassuring. This time varies greatly according to the individual section, but it is meant help with understanding health issues from both western medicine and oriental medicine perspectives, to show how health problems (physical, mental or emotional) are not separate, but in fact are connected in fascinating ways. Just as we have only this one body, and just as we have only one past history, it is inevitable that problems are interrelated. Sometimes one problem is the “fuel” for the next one. Each person's situation is unique. Personal sessions are completely confidential. Next I talk with you about the most significant changes I recommend and also respond to questions that you have about them. During this part of the session I fill out dietary recommendations in my Dietary Guidance Booklet, a pamphlet that categorizes foods in a useful format. These recommendations are personalized for your condition and current needs. Most foods are within the spectrum of a general macrobiotic diet with possible exceptions and nuances. These recommendations include all foods to eat, with foods to emphasize clearly indicated, along with some to minimize and to avoid. These recommendations provide a nutritionally balanced diet, with plenty of choices in each category to accommodate your own preferences. Along with its healing power, daily food must satisfy our sensory and emotional needs, otherwise we will not stay with this approach. and stimulate the flow of your body's energies for greater healing. Sometimes I recommend Chinese herbs, which can be powerful for vitalizing blood and energies. Often I discuss emotional, mental and personality problems in the context of your physical concerns. Many people find that these insights to be a powerful boost to their clarity of mind and spirit, for inspiring a new attitude for their growth and transformation. You are welcome and encouraged to bring a family member or friend to the personal session. During the feedback and recommendations part of the session, I encourage you to make a recording, if you want one. Most smart phones have free apps for recording or bring any other recording device. Obviously this is optional, but many people find it helpful for reviewing details of what has been discussed. You will leave your session with an 8 page "Dietary Guidance Booklet," personally created for you and your condition. Foods to eat, food combinations, and general proportions are included. Foods to minimize or avoid are clearly indicated, too. This Booklet contains personalized acupressure points that will help your healing. Special medicinal drinks may be recommended, as may be supplements or Chinese herbal formulas. 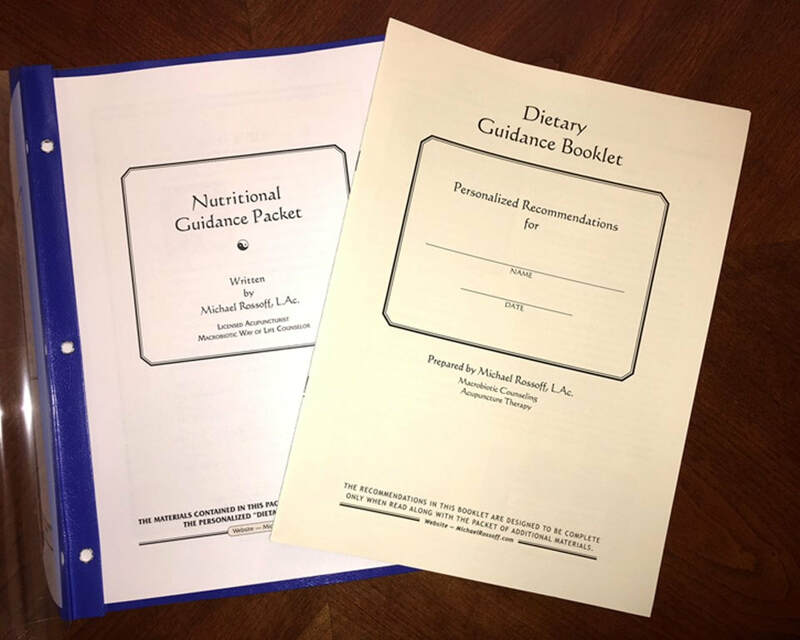 As a companion to the Dietary Guidance Booklet you receive a 52 page "Nutritional Guidance Packet" of important supporting material on interpreting and carrying through with your recommendations. This booklet includes menu planning information, basic recipes and cooking styles, further reading and more.